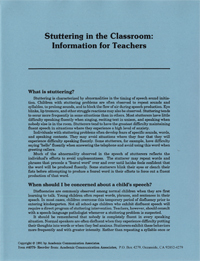 This easy-to-read handout includes information about the nature and treatment of stuttering. A reproducible checklist that can be used as a basis for referral is also included. The information in this handout will be relevant to teachers in all grade levels. Thirty copies of the form are included.